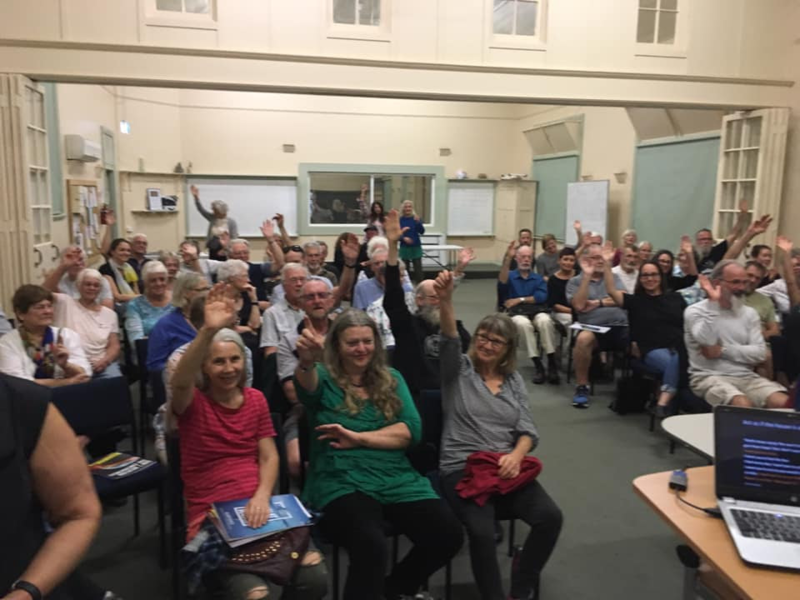 Former clinical psychologist and climate activist Jane Morton spoke passionately about the climate emergency in her power-point presentation in Bairnsdale last Tuesday. Over 60 people attended and this followed a similar successful talk at Yarragon the previous night and an ABC radio interview. A lively question and answer session followed. Basically the presentation was divided into two parts – why there is a climate emergency and what we can do about it. Interestingly there was no pretence about the old furphies that climate change was ‘debatable’ or ‘natural’ but rather based on the readily acceptable assumptions that the planet ‘is getting hotter’ and that ‘this requires urgent action’. It is necessary to frame the political debate on our own terms and language. The second part of the talk emphasised the need for urgent action. By everyone. We can start by “talking about global warming and the climate emergency and not climate change” Jane said. She then went on to talk about the massive success of the school strike movement started by 15 year old Greta Thunberg in Sweden last year and suggested that this and a non-violent campaign of direct action as per the “Extinction Rebellion” was the way ahead. She emphasised Greta’s words “I don’t want you to be hopeful. I want you to panic.” Jane then asked the audience “How many of you are prepared to be arrested protesting the climate emergency?” A surprising number of the audience replied in the affirmative. Question time raised a number of alternative actions including voting, legal action, financial boycotts and personally reducing our carbon footprints. Importantly it was pointed out that although more than 150,000 students and supporters across Australia participated in the March 15 strike there were no students in the present audience. The politics of direct action in conservative areas like Gippsland remains a conundrum and it can be argued that 40 years of direct action in the forests has achieved little and promoted a substantial reaction. Any direct action should not be directed at your ordinary workers but where it really hurts – at the politicians and vested interests. I personally prefer the Washington and Cook approach that has lots of avenues of action and does not rely on a ‘silver bullet’. The meeting was chaired by former East Gippsland Shire Council mayor Mendy Urie though unfortunately no councillors were present to hear of the Climate Emergency declarations by councils around the world. Thanks must also go to organiser Ro Gooch for inviting Jane to speak, and working to form a local climate action group.